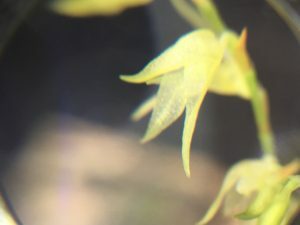 One of our tiny orchids today with flowers that really require a dissecting microscope to appreciate. 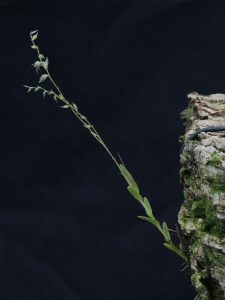 The species has a very unusual growth habit of short stiff growths and a thin terminal spike. 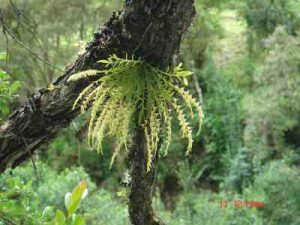 This is the only species of Frondaria and grows in cloud forest from Colombia to Peru at altitudes from 1300 to 3200m so it enjoys damp cool conditions although we have found it does better mounted than potted. We are hoping that our little plant will grow as well as this plant photographed in the wild by Ecuagenera.